Lalu Yadav's conviction is seen as a boost for the BJP, which had its corruption-focused attack on the Congress and allies blunted in the past few days with court orders in the "2G scam" and Adarsh housing scandal. 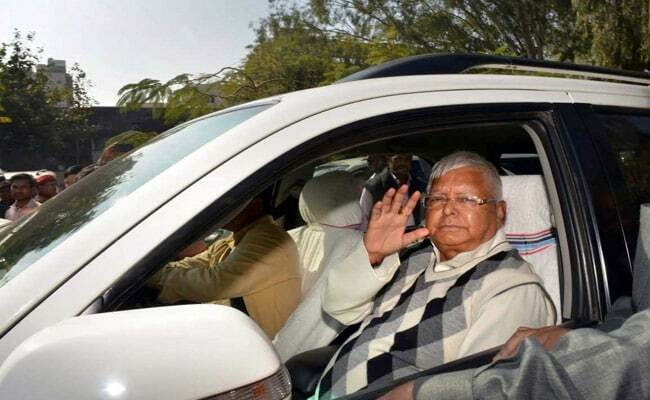 New Delhi: Former Bihar Chief Minister Lalu Yadav and 15 others were convicted on Saturday in the "fodder scam", a corruption case over the embezzlement of over Rs 85 lakh in government funds in the 90s. Mr Yadav, who was earlier convicted by a trial court and sentenced to five years in jail over a similar case in 2013, will be taken to jail. The conviction is seen as a boost for the BJP, which had its corruption-focused attack on the Congress and allies blunted in the past few days with court orders in the "2G scam" and Adarsh housing scandal. In early reactions to the verdict, Congress leader Manish Tewari said, "If these allegations are being investigated, why is it the Srijan scam not being investigated? Why are there different strokes for different folks?" "We have always said the law should take its course... (but) the central investigating agencies are acting like a pet performing parrot," he added. "This had to happen. You reap what you sow," BJP leader and Bihar Deputy Chief Minister Sushil Modi said on Twitter. "I was one of the petitioner in fodder scam PIL which resulted in CBI inquiry & monitoring by Patna H Court," he added. In another tweet, Mr Modi criticised Lalu Yadav again by saying he was convicted for the first time during the UPA regime and that the court had not convicted the BJP. Mr Yadav's party pitched his defence. "I believe in judiciary but in this case, CBI was arranging prosecution. Legally admissible evidence provided by us were set aside," Rashtriya Janata Dal leader Manoj Jha said. Lalu Yadav's Twitter account also posted a tweet just a verdict was announced. "Truth can be made to appear as a lie, as ambiguous or a half lie by concerted onslaught of bias driven propaganda. But blurred layer of bias and hatred will still be removed, come what may! In end Truth will win," it read. Union Health Minister and BJP leader JP Nadda was quoted saying that Lalu Yadav was not accepting the verdict and was instead resorting to blaming the BJP. "Lalu Yadav is even now politicizing the issue instead of accepting the verdict, just to deviate he is leveling allegations of conspiracy on BJP," Mr Nadda told reporters. Former Bihar Chief Minister Jagannath Mishra, after being acquitted in the Fodder Scam, told reporters that he had been Lalu's political rival and hence could not have been in a conspiracy with him. He also said he was mistreated by Lalu Yadav. "This is victory of truth & judiciary. We have to wait, suffer a lot, but justice prevails in the end. I wasn't even a min. I have been a political rival of Lalu Yadav. How can I be in conspiracy with a man who mistreated me?" he said.